Run for free! CureSearch has a limited number of free passes for Super Run, Sugar Rush, and Happy Halloween Run to give away to CureSearch runners and walkers like you! All you have to do is register with CureSearch (on this page), personalize your website, and start raising funds. Note: In order to receive your free registration, you must register, personalize your website, and start raising funds by the Wednesday before run day. Be a hero! Help CureSearch! Join the run! 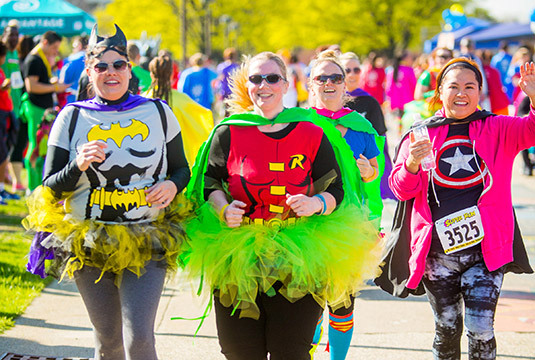 The Super Run, a superhero themed 5K to help charities like CureSearch, is coming to a metropolis near you! Join us in taking down the biggest villain of all, cancer. Don't see a location near you? Check out The Super Run locations page to see if there is an event coming your way in the future. To be the first to know about new event dates, email challenge@curesearch.org. Thanks to all our 2017 Happy Halloween Run participants! Stay tuned for more information about next year! Be sweet! Help CureSearch! Join the Run! This candy themed 5K is sweet, but finding cures is even sweeter! Click any event below to register as an individual or form a team!